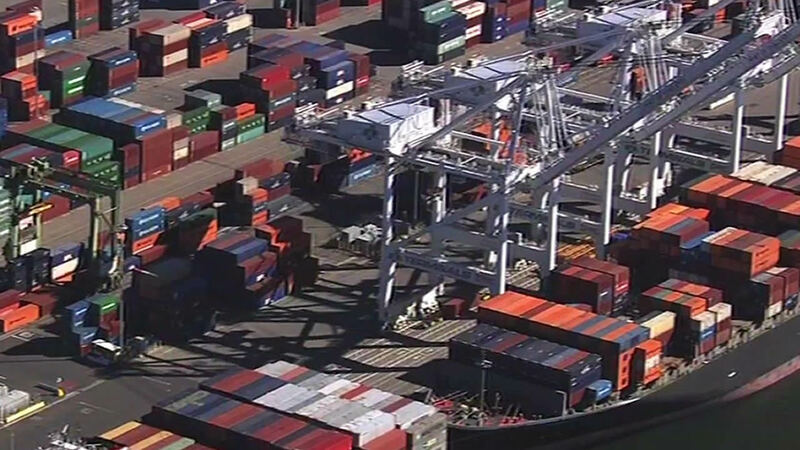 OAKLAND -- Port of Oakland officials said Monday that they will be installing four big gantry cranes to accommodate modern megaships that carry large loads of cargo. The $13.95 million project, scheduled to begin in April, will increase Oakland's capacity to handle large container vessels, port officials said. "The big ships come here on a regular basis. This equips us to take on more of them as shipping lines continue to scale up," John Driscoll, the port's maritime director, said in a statement. The cranes, which are 26 feet higher than the ones the port currently uses, will be located at the port's international container terminal and will be able to reach 141 feet above the dock. The cranes will have the height to load and unload ships that can carry up to 14,000 20-foot containers. Those are the biggest vessels that currently are coming to ports in the U.S., port officials said. The four cranes are 13 years old and weigh 1,380 tons each. They'll be supported by jacking frames while their legs are cut away and replaced with new, longer ones, according to port officials. The legs will be fabricated by Shanghai-based ZPMC, which manufactures the cranes. Port officials said it will take 10 to 12 weeks to lift each crane. The port's cranes can lift as much as 65 tons of containerized cargo. Once the cranes' height is increased, they'll be able to reach three rows of containers higher on a ship.